Next Post My, What a GIANT TV You Have! If anyone has a moment, I’d love a recommendation on a pretty seagreen color for an art studio/guest room. I’m considering using a Behr color called Watersprout, but am a little uncertain…! Ooh, I have the perfect color for you! The color of Sharilyn’s studio (of Lovely Design) is absolutely gorgeous. 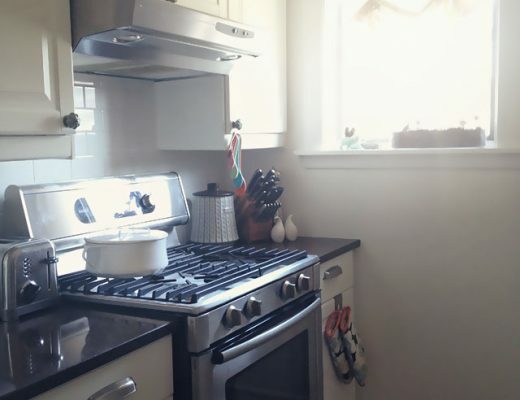 Here are the photos of her studio, and she’s provided the custom color formula here. I really love the brown you picked for the Library. Would you mind sharing the names of these paints with us? The library is “Afternoon Tea” from Pittsburgh Paints. The living room is “Wild Aster” from Benjamin Moore. Brandon’s office is “Driftwood” from Benjamin Moore. 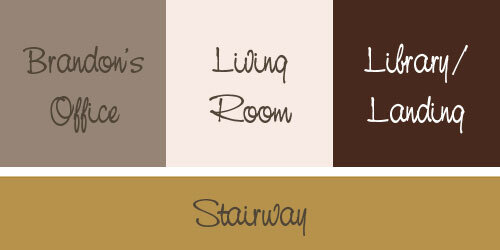 The new stairway color is “Campground” from Behr. Oh my goshness. I love this color! My room has neither the lovely molding nor all the charm of Sharilyn’s; but hopefully this pretty color will draw one’s eye from the rental-apartment taupe medley that is my carpet, and I’ll have a nice little studio after all! Thanks so much. Just wanted you to know that the person who actually asked the question appreciated your response! Thx again!